At WoolOvers we have been making quality natural knits and more for nearly 30 years. We know a thing or two about yarns. The cosiest Cashmere, the comfiest Cotton, the finest Merino Wool. We believe in doing it naturally. Our quality is superior to much of the high street for the price of an inferior acrylic mix jumper, and even though the price of wool has risen over 50% since the beginning of 2017, we try to keep our prices low. We aim to use 100% natural yarns where possible, though sometimes we use a touch of elastane to help our garments keep their shape, or plant based fibres for some of our t-shirts. In the main, our garments are 100% natural. We started our life at Country and Equestrian shows up and down the UK. Like our customers, we love the great outdoors and like to do our bit where we can. As a small company we don't wear halos, but we do have good intentions and genuinely care about people and the planet. We are constantly working to improve our sourcing and manufacture. Most recently we have begun to phase out shell buttons whose production are harmful to natural reefs. Our knitwear is made all over the world, but our sense of style is British. It is estimated that nearly a third of all plastics entering our oceans are from washing synthetic clothing. Polyester and Acrylic are plastic. Every time they are washed they release plastic micro-fibres into our water supply. 16x more plastic than from cosmetic micro-beads. Wearing quality Wool clothing can dramatically reduce this. Wool and other natural fibres biodegrade. Wool is also hygroscopic. It reacts to your body temperature, absorbing and releasing moisture. Keeping you warm in Winter and cool in the Summer. Renewable and sustainable, wearing Wool and other natural yarns can be better for you and the planet. Pure Lambswool is the highest quality of sheep’s wool. Collected from a lamb’s first shearing when they are six months old, their wool will never be as soft again. For that reason, Pure Lambswool is smooth, strong, naturally soft-to-the-touch, cosy... and expensive. Our Pure Lambswool knitwear is now made with a new process that is better for the environment. Our Pure Lambswool jumpers and Lambswool cardigans are steam cleaned rather than washed when they are finished, using much less water. It does means that our Pure Lambswool feels less soft until you wash it (softeners used to be added during the wash process), but they are now better for the planet and all jumper manufacturers will eventually adopt this method. Made from the wool of Kashmir goats, Pure Cashmere is our most luxurious yarn. Known for being light, soft and warm, Kashmir goats produce their fine long hair in very small quantities, making Pure Cashmere a real luxury. A Pure Cashmere jumper feels light-as-air, yet it can be up to eight times more warming than other Wool knitwear. Perfect for cold weather. We weave two threads together to create our yarn (2 ply) that makes it stronger and softer than other high street jumpers. So always check the label and know what you are getting. Best of all, our Pure Cashmere jumpers and Pure Cashmere cardigans (like most of our knits) are machine washable at 30 degrees. Wool jumpers, Wool cardigans, Wool coats, Wool scarves and more… 100% Pure Wool is the perfect yarn for cooler months. 100% Pure Wool is strong and durable which makes it perfect for heavier weight cables and knitwear. It will keep you warm and toasty when you are outdoors. Comfy Guernsey jumpers and cardigans, traditional Aran sweaters and polos, and cosy Fairisles all benefit from using 100% Pure Wool in their knit, giving them a chunky and rugged appearance. Teat them with respect and our WoolOvers quality will ensure that your 100% Pure Wool knit will last you for seasons to come. The Australian Merino sheep was actually born in Spain and has evolved wonderfully silky yarn over the years. Merino Wool is naturally elastic and very flexible which makes it perfect for more active usage. Merino Wool is also low maintenance as it absorbs odour and is more-or-less stain repellent. This makes it perfect for work wear. Our 100% Merino Wool skirts, 100% Merino Wool Jackets and 100% Merino Wool dresses are hard-working, beautifully soft and super flattering. Merino Wool garments are less likely to pill and have a lovely sheen so are great if you want to look natural and smart. Alpacas are closely related to llhamas. Their wool can be as soft as Cashmere and as durable as Pure Wool. Harvesting Alpaca is labour intensive, making it as expensive as Cashmere. In Ancient Inca, it was reserved for royalty and known as ‘yarn of the gods’. Alpaca is naturally hypo-allergenic making it great for people with allergies. Alpaca wool is naturally warm and we add generous amounts to our Pure Wool yarn to help soften our chunky Winter Jumpers and Cardigans, giving them a lovely silky touch. Yak wool is very similar to Alpaca, with longer hairs. We often use a blend of Yak Wool, Alpaca Wool and Pure Wool to keep our Winter knits soft, strong and cosy. Adding Yak to our yarn gives our jumpers a lovely soft ‘hairy’ appearance. Lustrous and luxurious with a beautiful sheen, real silk has been produced for well over a thousand years. Made from the cocoon of the Silk Moth, Silk yarn is made by boiling the cocoons to quickly kill the larvae, leaving behind the silk fibres. In some cultures, the larvae are then harvested for food. Many scientist believe that eating bugs and insects can help end world food shortages. Silk naturally repels mold and mildew. We add Silk to our Cotton jumpers and Cotton cardigans to give them an extra special sheen and to keep you cool in the Summer months. Cotton is breathable and comfortable, yet strong and durable. Cotton washes really well, so can withstand a lot of wear and tear. It also keeps the body cool which is why it is used for bedding and makes great Summer knitwear and t-shirts. 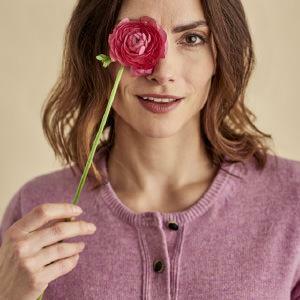 Cotton also holds dye well, so lots of our Cotton jumpers and Cotton Cardigans are in bright shades. Perfect for the Summer months. We sometimes add Modal to our Cotton yarn. Modal is made from the pulp of beech trees and is flexible and more absorbent that Cotton, making it perfect for active wear. Chemicals are used in the process of creating Modal, so we can’t claim it is 100% ecologically sound. However, Modal does use far less land than growing cotton and uses up to twenty times less water. Viscose has a lovely soft feel and a drape quality like Silk, but is less expensive. It is great for lightweight wrap tops and lovely dresses that hang well on the body. Like Modal, Viscose (or Rayon in America) is made from wood pulp. It is more environmentally sound than 100% synthetics such as Polyester, but chemicals are used in the manufacture process, so it can’t claim to be 100% ecologically sound. However, it is much more sustainable than Polyester and Acrylic that are made from petroleum, and it bio-degrades so ultimately won’t pollute our oceans. We use it sparingly where a garment needs to be light and fitted. Sheepskin is the hide of the sheep. Unlike leather, it is tanned with the fleece still intact. Sheepskin is renewable and sustainable. Our Sheepskin gloves are made from premium grade Sheepskin. Fluffy and soft, they will keep out even the coldest chill. Our slippers are double-bonded. The suede layer is separate to the fur. This gives our slippers better movement. We also have buttery-soft genuine Leather gloves. Our Leather gloves are great quality, fit snuggly and are naturally water repellent. Wearing quality knitwear REDUCES the number of garment you need to buy. RE-USING your knitwear each season ensures you are not contributing to the ‘fast fashion’ problem. RE-CYCLING your natural knitwear means the yarn can be used again in another Wool product, or left to bio-degrade. Polyester and Acrylic are made from petroleum and do not bio-degrade. We are not perfect at WoolOvers. But we are working hard and quickly to get better.